Anna Sato (left) and Shingo Maeyama. Photo: Rino Kojima. Saturday, May 14 at 8:00 p.m.
Robert Browning Associates, who is celebrating 40 years of presenting world music in New York, presents the New York debut of leading artists from Amami Island in southern Japan. 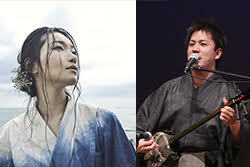 Anna Sato and Shingo Maeyama, two of the island’s most famous artists of the younger generation, perform the folk music of Amami Island, providing the New York audience with the rare opportunity to hear these hauntingly beautiful sounds. The concert will take place at Roulette, a music, dance, and intermedia performance space in Brooklyn. Amami is one of the richest sources of Japanese folk songs and uses falsetto to evoke feelings of sadness. Sato, who began singing shimauta, or “community songs,” at the age of three, will join Amami Folk Song Award winner Shingo Maeyama on sanshin. While harnessing the moving melodies of shimauta passed down for generations, each artist is a seasoned master of their craft and a pioneer in new expressions. Their music is unmistakably Japanese and yet universal in its appeal, delivered with remarkable virtuosity. This program marks the US debut of Anna Sato, and the New York debut of Shingo Maeyama. Amami is a small archipelago of islands that lies between Kyushu and Okinawa, about 200 miles to the south of Kyushu. These islands have had a long and independent history of their own, stretching back to the Paleolithic period. Today Amami is officially part of Japan, but the archipelago still has its own dialects and cultural traditions that are distinctively different to those of mainland Japan. In the 15th century, Amami was incorporated into the Ryūkyū Kingdom (modern day Okinawa), before being colonized by samurai from Satsuma in southern Kyushu in the early 17th century. Satsuma turned the islanders into indentured serfs and used them to harvest the lucrative sugar cane crops. Folk music, sung in the distinctive dialects of Amami, is one of the main cultural resources of the islands. Island communities originally competed with each other in song events known as uta ashibi, and many of the songs have been preserved. However, this culture is now under threat as the number of native speakers of the local dialects has steadily declined in the post-war period due to Japan’s standardized education system and powerful, centralized media. Sato, whose rich voice evokes the spirits of her native Amami Island, has won many shimauta contests. With her powerful voice, she has released seven recordings (including her 2005 CD debut on Pacific Moon Records), receiving international acclaim for her distinctive singing techniques. She has participated in many dance productions as a musician, and in autumn of 2016, she will collaborate with Belgium-born choreographer Sidi Larbi Cherkaoui on his new creation in Gothenburg, Sweden. Maeyama studied with a renowned traditional singer and won various awards, including the 2011 Grand Prize at the Amami Folk Song Competition, Japan’s most prestigious Amami shimauta competition. In 2009 he toured Central Asian countries, including Uzbekistan, Turkmenistan, Azerbaijan, and Georgia, and collaborated with local artists. Robert Browning, whom The New York Times called “the entrepreneur who almost single-handedly created and filled New Yorkers’ passion for world music” has presented more than 1,800 concerts of world music and dance from internationally renowned figures to emerging artists from more than 100 regions. The co-founder of the Alternative Center for International Arts / Alternative Museum and the World Music Institute, Browning organized the Gypsy Caravan, the New York Flamenco Festival, the New York Winter Blues Festival, the Masters of Indian Music series, the Musical World of Islam, National Heritage Masters, and tours with qawwali master Nusrat Fateh Ali Khan. For more information and to purchase tickets, please visit the website of Robert Browning Associates or call the box office at 917.267.0363.